Councilman Peter Koo talks about his work in office at a candidates’ night in Flushing as his Democratic primary challenger, Alison Tan, looks on. With their Democratic primary challengers arguing the opposite, Councilmen Paul Vallone (D-Bayside) and Peter Koo (D-Flushing) each made his case for why he should be re-elected last Thursday at a candidates’ night organized by the Broadway-Flushing Homeowners Association and the Station Road Civic Association at The Church on the Hill. Vallone pointed to the progress he has made in city government on behalf of the neighborhood in securing funding and passing legislation. The candidates all spoke about themselves, their experience and their goals for five minutes before a question-and-answer session with questions anonymously submitted by the audience. The allocation for the district follows previous city monies used for it since his 2013 election, like the major renovation happening in Broadway-Flushing’s Bowne Park, which will get a new playground, Vallone added. His biggest accomplishment, he said, was “Taking a district that was so far behind and reconnecting it back with your other elected officials, with your other city agencies.” Vallone added that the connection between executive branch agencies and the Council district was weak before he took office. The area near the Broadway station for the Long Island Rail Road has been a concern to the homeowners’ association. There have been prostitution arrests there. Vallone, who has worked with the NYPD to get illegal prostitution parlors shut down in his district, spoke about the challenges of addressing the issue. “When you shut one down, four more pop up and it’s very difficult to attack,” said the lawmaker, a former Community Board 7 member who hails from a Queens political dynasty. Although happy that he was able to get the neighborhood coordination officers program to come to the 109th Precinct — the first one in Queens to receive it — the councilman mentioned how other tools could be used to better fight the problem. Vallone is facing a challenge from Flushing activist and land-use consultant Paul Graziano, who spoke after the incumbent left to catch a graduation ceremony in his district. The pair previously faced off in a primary race in the district’s last election. The challenger was highly critical. “My goal here tonight is to expose a lot of the half-truths and lies that my opponent just told you,” said the activist, who received applause when he got up to speak. He accused the incumbent of being dishonest about the level of funding secured for District 19. The land-use consultant said that were he or any of the other contestants who failed in 2013 elected instead of Vallone, the monies dedicated to the district would not be much different. “We all would’ve received pretty much the same amount of funding,” he said, citing how Council Speaker Melissa Mark-Viverito (D-Manhattan, Bronx) more or less gives the body’s funding out to lawmakers evenly, unlike her predecessor. Graziano worked to downzone Broadway-Flushing with then-Councilman Tony Avella and worked to put the neighborhood on the United States and New York registers of historic places. But recognition on the state and federal registers give Broadway-Flushing no protection from aesthetically out-of-sync buildings. Vallone brought the Landmarks Preservation Commission to Broadway-Flushing in the hope it would support landmarking, but the agency declined. Given the LPC’s repeated refusals to make Broadway-Flushing an historic district, now-state Sen. Avella (D-Bayside) has advanced a bill in Albany to establish “architectural districts”: a classification that would create a new avenue to protects neighborhoods that don’t meet the commission’s preservation threshold. Graziano said that the “first bill” he would introduce would be Avella’s architectural districts legislation. Although candidates were given the same amount of speaking time at the forum, Graziano has received campaign donations from Janet McCreesh, the president of the homeowners association, and Rhea O’Gorman, the chief of the Station Road group. None of the others received contributions from them, according to city records. 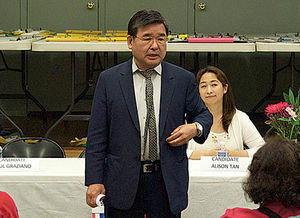 The two-term incumbent Koo and Community Board 7 member Alison Tan are vying in a Democratic primary for District 20. Those represented by the Council seat live west or south of the Station Road Civic Association’s and the Broadway-Flushing Homeowners Associations’s respective boundaries. According to the challenger, City Hall is not giving the district what it deserves. Because of its “explosive population growth,” the candidate said, the area’s Council member should aggressively advocate for the district to get higher levels of funding. Her background in finance, Tan is a managing director at real estate capital advisory firm Ackman-Ziff. She spoke about accountability in the private sector that she feels those in government lack. “If we don’t deliver on the things we say and we don’t fight for the things we say we’re going to do, you’re subject to performance reviews,” the candidate said. Under Mayor de Blasio, the NYPD almost completely banned stop-and-frisk searches. When asked how she felt about the policy no longer being used, Tan discussed how the policy is used elsewhere to search ethnic minorities. During his remarks, Koo discussed how as a Taiwanese immigrant, he climbed up the American social ladder from working seven days a week as a fast-food employee putting himself through school to eventually owning a chain of pharmacies. One in the audience asked about how the congestion of Downtown Flushing might be eased and how parking could become easier. Koo said that using mass transit rather than cars should be encouraged and proposed one method of making parking easier in the area. The councilman, who is the chairman of the Committee on Landmarks, also discussed a bill signed by Mayor de Blasio that he supported which prevents the city from having a decades-long backlog for historic sites to consider for protection. The lawmaker also spoke about how the Bowne Street Community Church, a historic house of faith in Flushing, recently became a landmark after he advocated for the designation. Whether minor infractions like smoking marijuana or drinking in public should be decriminalized was also discussed. Koo supports lowering penalities for the offenses.